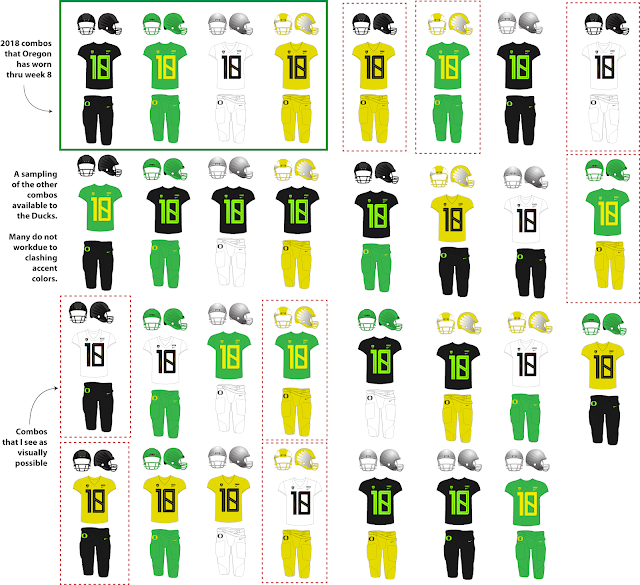 This blog is an extension of the many great Oregon-specific uniform trackers out there. See the right side bar for links to those past trackers! It's been since week 7 (a whole month ago!) 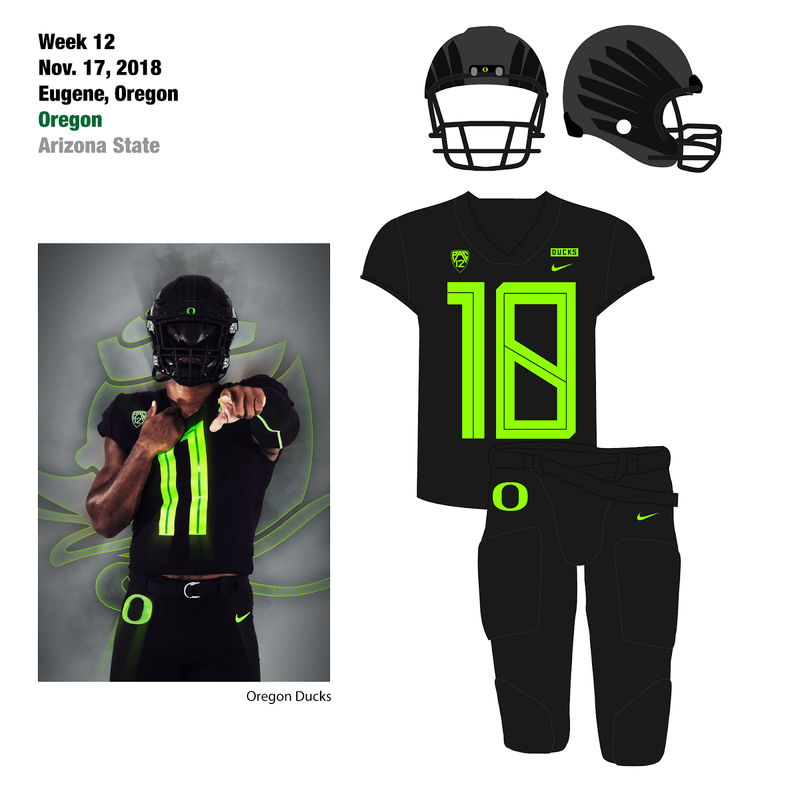 that the Ducks wore any color. The last 3 weeks have been 2 road games with mono-white and a home game with mono-black. 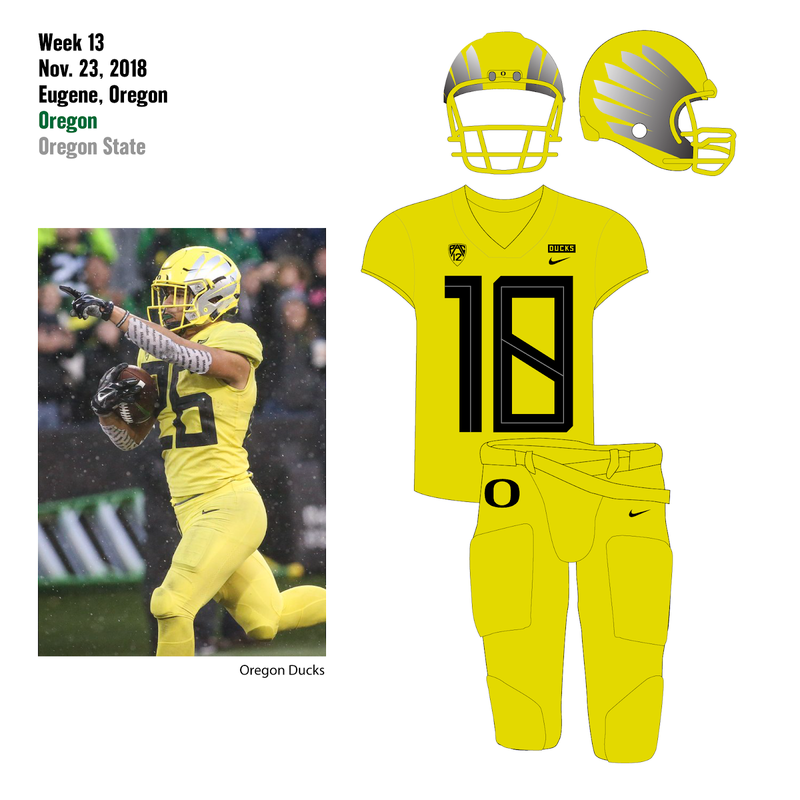 This week brings us the third time Oregon has worn this combo this season. Last week we saw our first "minor" mix/match mono. This week the Ducks are back to full mono, but with a twist. Its a Nike Jordan Jumpman uniform with different number font, different shade of green (we had apple, neon and now forest?) and Jordan's elephant skin pattern (??) sublimated on white numbers. WARNING: OPINION AHEAD....I'll be honest that I'm just not clear on the concept with this set? The one thing they have going for them is that they're not some wild, unusual, crazy concept. They are kinda boring, and only a logo/font away from the normal black set. But that is also their downfall. What is their hook here? This week is usually the week that teams wrap themselves in the flag for Veteran's Day and "Salute to Service" types of things. But the Ducks are saluting an—albeit great/famous—basketball star who has no connection to Oregon except that he is a brand ambassador for the hometown Nike? I love what Nike has done for UO, but just don't get the timing since this must have been planned for months/years? I'm not bagging on uniforms because of the W/L record since these are planned way in advance. 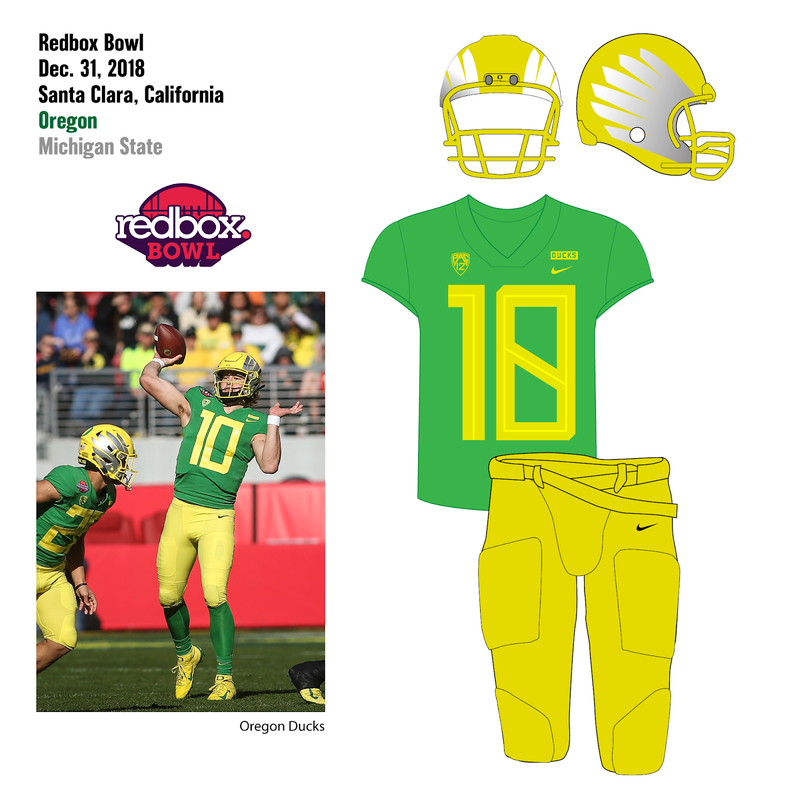 The Ducks have had some great alternate uniforms but more often some horrible ones ("Grellow" helmet, Lewis and Clark, State flag...) I would not lump this in with those, but these seem to fall into the category of the uniforms they wore last year for the childhood cancer game, which were variations of the normal uniform, but not special. So the Ducks finally did break from their 7-game lock on the same combos they previewed in August. (See my posts about this previous to this post.) Black helmet over all white. Against Arizona, which wore all red...so I guess its like the old joke: "What's Black and White and Red all over?" 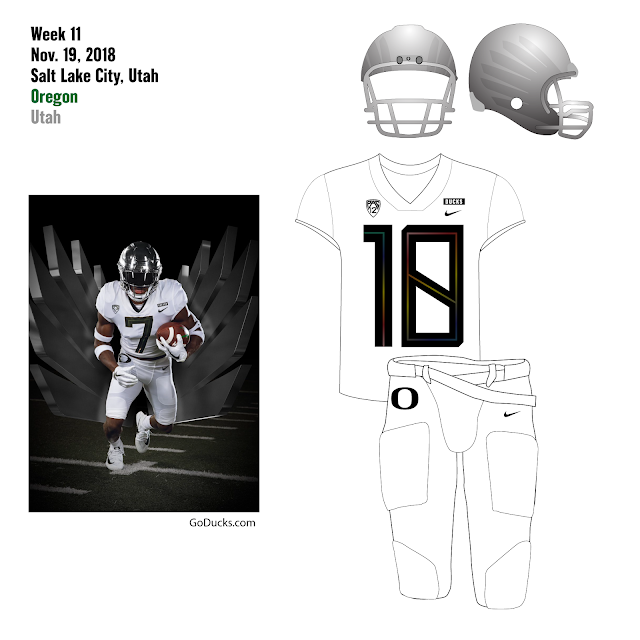 Here's the interesting fact...In looking back 6 seasons, the Ducks have not worn this combo of black/white/white! Usually they pair it with yellow jersey or put colored pants with it. And you have to go back 2 years to get a black helmet with white jersey. Will the Ducks go beyond mono? 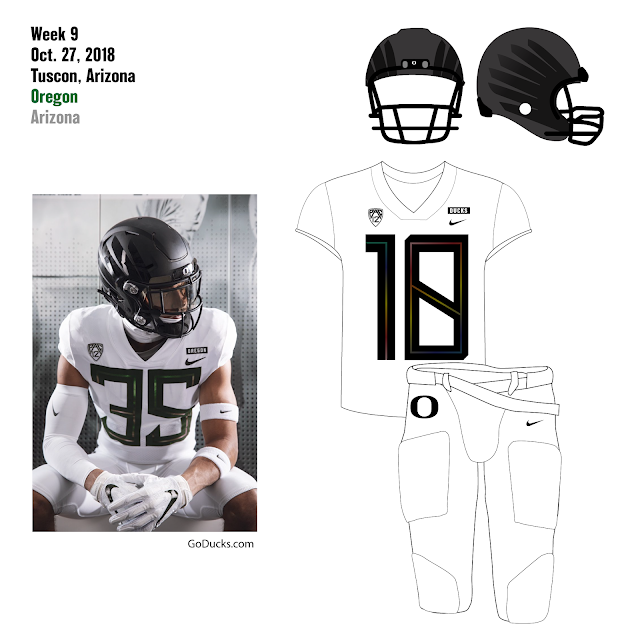 In my previous post I examined how Oregon has only worn the mono-colored versions of their new 2018 uniforms so far this season. That led me to want to test out other combos, as the Ducks have been famous for over the years. The result is mixed, pun intended. 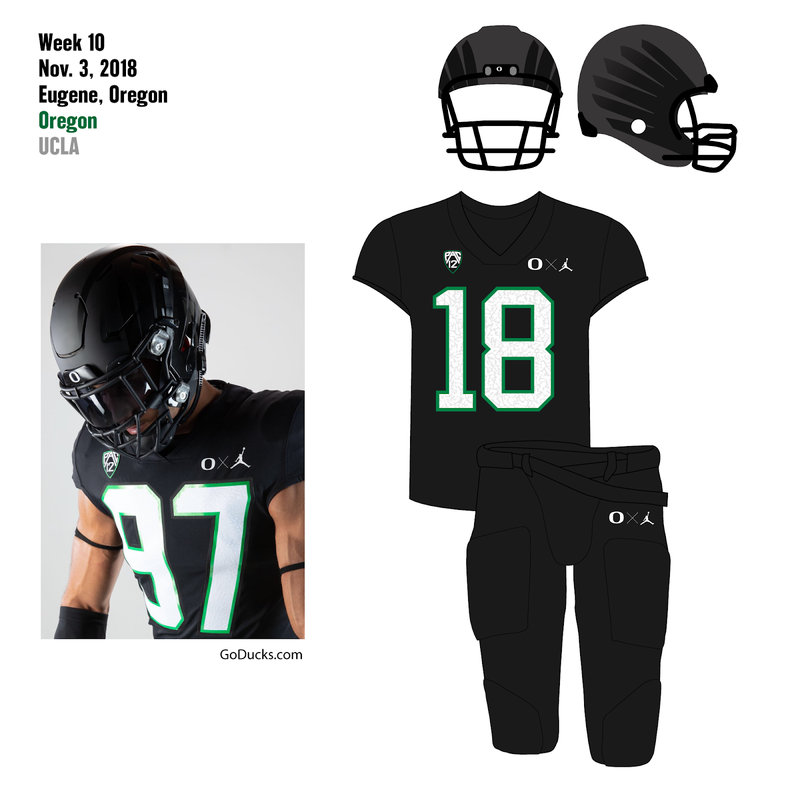 Since they have so far only shown one version of each pant, jersey and helmet, this leaves the accent color (logos, numbers etc) as the determining factor in matching sets. (In past years, they swapped accents willy nilly, especially on helmets.) This is complicated by the fact that the black uniform uses neon green accents that do not match the apple green of the other sets. And the yellow uses only black accents that feel out of place with the green jerseys. I am a freelance graphic artist, designer and photographer, who also happens to have two young boys at Pleasant Hill Christian School, a small private school in Sebastopol, CA. I teach art to the 60 kids at PHCS.